Split along the glue joint - why? The other post about splits in the shop was well timed as we just got a call about a Boos Block we installed about a year ago. It was finished with oil that the home owner swears they are maintaining. It looks dry to me but we have an appointment later in the week to see it in person. I'm guessing humidification is to blame since this crack opened up a couple inches on Saturday and is now about 12" long. Why would it crack along the glue joint? This would indicate an improperly prepared joint, at least how I understand all of this, but isn't the glue supposed to bond stronger than the wood itself? How would you handle this? We had to cut the original block to size so we voided the warranty from Boos. Is the homeowner to blame for not "properly" conditioning their home? Is the only solution here to redress the joint and reglue? I would prefer to leave it in place and not bring it back to the shop. Thanks for your help. I rarely post but really enjoy this forum. How's the block mounted? I've seen more than one of those screwed tight to the cabinet, no oversized holes in the cabinet cleats. So when the solid wood shrinks or expands, something has to give. If you didn't have slots or oversize holes in the cabinet, it's your mistake to fix. The top has to come off and the holes opened up. Then it's a discussion between you and the homeowner. Do they want you to take the top back and rip it down the crack and reglue, or are they okay with you gluing in a small tapered ripping and then sanding and refinishing. What the responses to the previous post doesn't address but may be the culprit is allowing for movement in the installation. Did you fix the top with slotted holes for the screws? A top could easily shrink 5/16" in dry winter conditions. Sorry for not including our installation method - we drilled an over-sized hole and used a screw with a fender washer to allow for seasonal movement. I don't think we restricted any wood movement and would be surprised if that were the cause. We've done a few like this and this is only one we've gotten a call about. Extremes of humidity and dryness can swell and shrink hard rock maple and/or oak enough to cause small seasonal checks to appear, usually at the ends of tops or at the end of a lamination. This possibility, though remote, is an unavoidable condition of enjoying the character and beauty of a living material. Cracks filled with a cellulose filler of the right tint become practically invisible. You can help preserve your wood table top by keeping your home humidified in the winter and by refreshing your table often with Boos ® Mystery Oil and/or Boos Block ® Board Cream. All Butcher Block products is recommended to be oiled on all surfaces with Boos ® Mystery Oil and/or Boos Block ® Board Cream at least once every 1-2 weeks depending on the use or household conditions. This will help protect the wood from damage. With a minimum amount of care and maintenance on your Wood Table Top, you can lengthen the life of the top for many years. We always fasten one edge hard to the cabinet. Then drill 1" long slotted holes. Fender washers and screws are fastened lightly with a screwdriver. You would have to drill a huge hole to allow for the expansion in both directions. The idea is that you control which way it moves. So what happened. The moisture content of the counter top went down enough for it to shrink. It had a bad glue joint. It should have cracked next to the glue joint. This all could have been prevented by allowing the counter top to move around more. Cracks near the ends are not unusual perhaps a screw went into the joint ? I'm not anticipating installation to be the guilty party. I understand about screwing one side tight. I don't do this because if you have more movement than you allowed for at the other end, or if you screw isn't centered in that hole, trouble can arise. We drilled 3/4" holes in the stretchers at the front and rear and used fender washers like Adam described. We've done a few of these and this is our first problem. They sent me a picture this morning. It looks like there are wood fibers in the joint, so maybe not a total joint failure? I would assume with a total joint failure both sides of the joint would be clean, since the glue never would have achieved a good bond with the wood. And I'm not thinking these fibers are food/trash as this just opened up on Saturday. When you look at the to, meter the underside in several places along the edges and in the center of the top. If you have pinless meter, measure the top surface. Use a sling hygrometer or a digital one to check the RH in the room. Ask about humidification. Have copies of Boos info as well as Spekva (see other thread) to show to your customer. Then go away and make your determination. I see what I would call glue fibers more than wood fibers in the open joint. At 1/16", that is a lot to fill - anticipating that it could try to close up and then cause compression set, and another crack nearby if the RH change is cyclical. I'd suggest a hard colored wax for the time being. How do you fix anything after its been oiled? What said to me wood fibers is a zoom in on the very bottom edge. It looks like some of these pieces jag into each other. Glue wouldn't likely do this. So if an increase in humidity should close up the joint, would a decent approach be to do nothing now and wait for the interior humidity to normalize and then epoxy? I'd though about bringing a humidity gauge with me, but I'm not sure what revelations it will bring if the overall temps are up and the heater isn't running all the time. This would likely show higher humidities, which would discredit my explanation for what is going on. Overall, this is a pretty crappy situation for all involved. I took another look at the glue joint. It looks like something dissolved the glue. Like it turned to mush and the moisture change tore it apart. What adhesive does Boos Block use on their countertops? What has the customer been putting on it? Call Boos Block and ask them what chemical would aggressively attack their adhesive. I am told they have put mineral oil on it and oiled it every month. I won't get to see it until next week sometime as my appointment got pushed back. Boos won't reveal their glue information. or 2 on the underside. Try a clamp see if it goes back together first , good luck . It would be nice for Mr Jones were the glue to be found at fault, but I have seen that look before. Glue or wood or both or neither, it is open, yawning trouble coming your way. I have to say it is heat and low humidity. This thing is open because that end is drying out and shrinking. But the bulk of the wood has not dried out as fast as the end. It was just looking for the weakest place to crack. I will bet that a heat register/wood stove/dishwasher is much closer to this end than the other. The only other cause I can offer is that one piece or the other is/was a bit higher MC than its neighbors, and as it equalized, it shrunk and opened. Hence you know where to meter. When one looks at woodwork, one thing historically is that end grain was always coved up. Stair tread returns are a good example. Even the better flooring jobs had a perimeter that covered up the end grain in the main field of the floor. Some exterior doors had 'shoe' molding that covered the ends of the stiles, and all along the bottom rail. Butcher blocks did not have returns, but they did have the threaded rods since the glue was not reliable and compression set was a small price to pay for the use of that end grain Hard Maple. I think threaded rods, countertop bolts and even a big a** clamp would not fix it, or fix it for long. You can fill it with colored wax as a goodwill gesture, take no blame, and ask to watch it for a year. The old guys I used to work with said that if it lasts a year - a full cycle of seasons - then it will last forever. D - Good stuff with the draw bolt. It would be almost as much work vs. ripping, jointing and regluing. I'm leaning towards David's suggestion of wax-and-see, but I do will keep that idea in my back pocket. David - The top has been installed for eleven months. I also agree about low humidity and heat causing this to happen, and to happen so quickly (it was suddenly there on Saturday, when the wind chill was around zero). However, why did it pop at the glue joint? Bad luck? Was that the weakest link in the glued up chain? Was it shrinking and was going to crack at the weakest point, and the joint happened to be it, even though it was strong enough to keep everything together when the humidity was in a more suitable range? If you put a draw bolt under it, make sure to go out in the spring and loosen it up. If you don't, the wood cells will crush under the bolt head and the crack will open back up next winter. Put too long of a rod under it, and the top will want to bow this spring. Many furniture makers will machine a sprung joint on a table top in an effort to prevent this type of glue line failure will not happen. Not possible on a butcher block like this. This is a pretty regular failure mode when there is wood shrinkage and all elements are not perfect. How big is this counter top?. If its held down only by the screws you described, it should come off in minutes. Stuff the thing thru the table saw with a decent blade. Wash the oil off with acetone. Glue it back together with epoxy. Reinstall it. Why did it crack on the glue joint? It had to crack somewhere. While the glue joint may cause you to question all the glue joints in the entire top, it may just have been in one end of one pice that did not get prepped correctly - or as well as all the rest of the joints. Planer snipe, ripsaw angle, less glue, burnished wood surface(s), glue not allowed to 'wet out', etc. can all cause a stressed joint to fail. You have no control over that since you did not make the top. I would say the glue definitely failed. Also, thinking there was a funky board that provided a lot of force to open that big of a crack. There is a lot of stress there, looks like more than just moisture content. I had a redwood countertop crack at the end by the stove, was able to glue and clamp, but that was redwood, not maple and it didn't crack on the glue joint. I don't think it can be just that the glue failed, or that there was a wild piece of Maple. 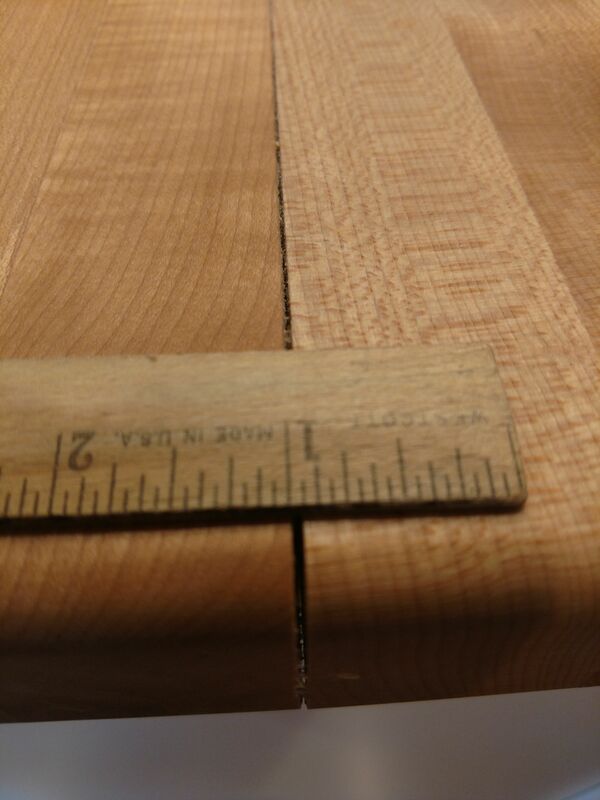 If one were to glue up a 40" wide top like this, and leave 6" of joint dry at or near the midpoint of the top, the joint would not open up in a relatively stable environment. To force that joint open as it appears would in fact require about 20" of solid Maple bending away from the joint on one side tor the other - nearly impossible. Beyond that, the parts would all need to creep along each other to accommodate that movement. Also not possible. A wild piece of Maple will also telegraph at the glue joint for a bit along its length. It would have had to be wet, and dried after glue up. I think that if anything, that one piece would crack in its approximate center since the two edges were glued. I'll bet lunch it is just old fashioned environmental shrinkage. "A wild piece of Maple will also telegraph at the glue joint for a bit along its length. It would have had to be wet, and dried after glue up." Can you please explain this? I follow the rest of what you are saying but don't understand your telegraphing comment. We, on rare occasion, water-pop/raise-the-grain to check to make sure we don't have any glue residue leftover before we start finish work. We resand the piece after the water has dried, but to read your comment it sounds like we might be doing something detrimental to the glue joint by wetting it down. We're using TBII and aren't soaking the joint - just wetting it with a rag so simulate finish. Telegraphing refers to the slight difference in 'levelness' in a surface. This can be seen and/or felt with fingertips. Sometimes yellow glue will telegraph a glue line. That will be in the line only. Wetting the top after glue up will not harm it if done with reason and restraint. Good practice in fact, for oil finished tops. Let's say you unwittingly glued a 12" MC maple strip in between Maple strips at 6" MC. All the parts will come to be the same MC over time; the "wet" one will drop in MC and shrink a bit - without looking it up, I'll say .020". It will pull down (and up) on the glue joint to accomplish this, leaving a bump of a few thousandths of an inch. TBIII will not resist this movement and will gladly let that part move against the other, and telegraph a definite line. TBI is less likely to creep, and may only telegraph a small line. Epoxy will likely not allow it to creep at all, and show the least line - or none. Above is shrinkage in thickness. The part will also want to shrink in width, about the same amount, depending upon grain orientation, etc. If it can find no resiliency/relief from its neighbors, it just might open up a crack about .010" wide - in the wood, if the glue holds. Again TB III may welcome the relief and let go. TBI less likely. Epoxy also less likely. No matter, if the glue holds, it will then crack in the wood. You did not mention telegraphing, so I did not use it in my reasoning. Only in response o the fellow that suggested it was a wet part that cause your problems. As stated before, I think it it is heat/humidity in service that has caused your problems. I have had this exact problem more than I care to relate. I am glad to see the fad passing, and will not mourn the loss. As you know, all the above is subject to the Two Laws of Woodworking: 1. Wood moves 2. We will all disagree as to how, why, when, and where and what we can do about it. I can see that I'm most likely wrong about my "wild wood" theory, now that I think about it and read the replies. But, this crack is so large. I wonder what the difference in relative humidity at the factory is compared to where it's installed? Or was the moisture content of the wood too high to start with? And now that I think about it, I fixed that redwood countertop with fine slices of redwood and 5 minute epoxy. I also didn't want to remove and take it back to the shop. The homeowner was fine with the repair and understood that it was not exactly all my fault. Perfect explanation. This is how I understand things to be, I was initially lost in your wording. So epoxy and TBI, by allowing less creep, would be a better option for anything glued up that may or may not be subjected to undesirable environmental factors (too dry or too wet MC) by the end user/owner? If I follow you correctly - this would be since any movement occurring, outside of regular fluctuations, would likely split the wood and not have the glue let go at the joint, revealing something irregular in the environment, rather than a manufacturing defect. This question is purely from a CYA perspective and not how we do business. Also, I understand TBII to have greater strength at the joint than TBI, but not by much. Would this greater strength be negated by the increased amount of creep that could possibly allow a failure at the joint? What PVA glue are you using? The two laws of woodworking remind me of the two laws of construction - 1) there are at least six ways to construct anything, 2) anyone not doing it my way is wrong. In my experience, and this is seen at the final long term finishing end. Come back after a year and what's it look like. Proper glue up (2) 3/4" maple boards jointed with sharp knives and edge glued. Finish is sprayed white paint. TB1 joints are invisible. The hardness best matches the wood. The gluelines are very thin. TB 2 the glue lines may be raised. Its a softer glue. TB3 greater chance the line may be raised. Epoxy joints are often visible because the resin is so much harder than the wood. Also if done properly the glue line is wider. Epoxy works best with sawn wood versus jointed wood. It like the roughness. The question of strength is irrelevant. All of the glues are stronger than the wood fiber bonds. The failure should occur next to the glue joint. We use TB1 exclusively for interior work. Except for mortise and tenons that matter like interior doors(it gap fills much better). Epoxy for the vast majority of exterior work. TB3 for exterior work where epoxy would be considered a waste of time. Thanks for sharing your experience. With your test pieces - what kind of swings in humidity have they experienced in your shop/showroom/home/where ever they have been stored? Typical for a residential installation? What are you using for M&T joints? It wasn't clear from your post. Also, armed with this knowledge, I'm very inclined to switch to TBI for our glue ups. I think I understand the benefits of TBII, but in what circumstance would it be better than TBI, given the creep and associated weakness? Cutting boards only? How wet/dry would any piece really get before the only thing wrong would be the glue joint (failed finish, warped door, etc)? TB3 gap fills better than all of them other than thickened epoxy. Chiseled m&t joints are pretty rough on things like interior doors(not cabinet doors). TB3 fills those gaps nicely. I don't know why people use TB2. It was supposed to be a great advance. We watched it fail again and again in exterior use when it first came out in the 90's. I remember this one kitchen job. $75k in 2005 or 6. Beautiful beaded ff, tons of finised ends. Very big kitchen. I remember this one glue joint on a floor to ceiling(9')finished end. I used TB2 to glue the ff to the end panel. soft maple. I sanded it flat. primed it. it raised a few days later. I sanded it. primed it. it raised a few days later. This continued while I was doing all the doors & drawers. I finally carved out the glue joint and filled it then primed it a few times to bury it. The final finish was high gloss white. You could see anything & everything. Thankfully I only used it on a couple of joints. I've seen it happen many times on trim jobs. When I was doing trim in the late 90's we started using TB2. All of the miters on these jobs are biscuited and miter clamped. They do not open. You could often see the glue in the miter creep out when they painted them. TB2 is really good for RF. Its got this other annoying feature of being really sensitive to freezing. We've had a few threads about that as well. We don't use poly glue either. Its simply a bad wood glue. Thanks for sharing your experiences here. I'm going to do a little experimenting and am definitely leaning towards switching to TBI. I've experienced the same telegraphing glue lines on painted work before (not much for us) and we've gone through the same procedure as you with resanding just to see it raised the next day. I could never really explain why this was happening and was attributing it to changes in wood rather than the glue. Thanks a ton. This has been a real eye opener. Our experience with, and use of glue is similar to Adam's. TBIII is in the trash. Banned from the shop. It loses 70% of its strength at 180 degrees. Any dark wood or dark finished wood with direct UV on it will get to those temps easily. We spent about $4,000 cost in repairing/replacing panels on doors that were glued for width.Once we talked to Titebond and got the story, I could not believe it. Then we found out that TBIII - and all water based glues - will not hold in about 20% of Western Red Cedar. The wood we use for exterior shutters, beams, etc. While we sweat out what might fail, we now use epoxy for any WRCedar project. Beyond that, TBIII creeps. Bent laminations will not be bent for long. TBI is a harder glue line, but can still raise from a joint where it is a little less that perfectly tight. We use it on interior bent laminations and regular laminating, edge gluing and joinery. Interior glue of choice. We use TBII for some exterior work that will not get wet, but find ourselves using it less and less. No trust. Epoxy is becoming the other glue of choice, and we will also use Urethane for some things. Our problem with epoxy is not over clamping. Urethane is good for many things, and has a longer open time for complex door glue ups. It can not be used for veneer, and cautiously for laminations, with lots of pressure. Easy clean up and sanding. What/who's epoxy are you using? We use West System on super-rare occasion as a glue and semi-regularly as a knot filler. We always let it cure overnight. I've always been concerned about over-tightening it only because I've heard other mention not to do it. I have no idea what would classify as over-tightening. We haven't had any issues with West other than it being messy and expensive. Edge gluing is better off of a saw. Not a Forrest scraper blade. Just a regular rip blade. The roughness of the cut provides plenty of room for the epoxy. Likewise, sand the faces for lamination. We take the boards directly out of the planer and run them once thru the wide belt with at least 100 grit(flat work) 60 grit(curved work). Epoxy: I've do/have done a lot of boat building(wood & composite). We do a lot of exterior arch ww. We also do a lot of curved work. West System is the easiest for most people to source. Its a good product and the tech guys are top notch. The problem is its a really old resin system 5:1 mixing ratio. The hardeners are stand alone they cannot be mixed together. Newer resin systems(20 years old now) are 2:1 ratio. The hardeners are mixable. You get a fast and a slow and mix them 50% to get medium. Or anywhere in between. Or mix them to use up the product. Obviously 2:1 mixing is childs play. 5:1 is a pain. The other thing is the viscosity. The West is a medium viscosity do all resin system. Its okay for fiberglass and ok for wood. Not great for either. The West has a problem with blushing. It reacts with moisture in the air and it can leave a waxy film. This is usually not an issue with woodworking. It is a big problem with composites(fiberglass). We've been using MAS epoxies for about 15 years. They make 2 different resins. One is thinner than West, the other is really thick(Flag). Its thick enough that it will not soak into wood very far. The resins can be mixed together. Likewise the hardeners. Their system doesn't blush. All of the epoxies are similar in pricing. We waste less of the 2:1 because you can mix small batches quickly and accurately. Jamestown Dist is about 45min from our shop. They sell everything to the New England boat building market. They have west, sys3, mas, and a couple of other systems. I hadn't noticed the green one Entropy before. West System. We have the metered pumps for proper mixing - well worth the expense. We weigh it for larger amounts. We may convert over to the Jamestown Dist. products in the near future for even simpler mixing. We have always used the pumps. The pumps clog, get stuck, loose suction, people don't push down the whole way. Not really that accurate in the end. We still use the pumps with the MAS 2:1 for small batches. Its the bigger batches you need to worry about. Has anyone ever tried plastic resin glue? I have had good luck and no creep. Sort of hard to mix at times and the the shelf life is a problem. I would use more plastic resin glue if it were not so temperature sensitive. I like the shop at about 63 degrees during the Winter, and 64 degrees during the Summer. The plastic resin must have 70 degrees as a minimum, so it is difficult to use except at the end of the day. It was the glue of choice when we were doing 2-3 wood tops a week.